This slot revolves entirely around the person of Gonzalo Pizarro, who also plays a big role in Netent's advertising. This is a guy you will spot on many of Net Entertainment's banners, at many online casinos. The slot has five reels and three rows, even though you wouldn't really call them reels, with the active avalanche feature. The avalanche function means that all symbols part of a winning combination will explode with a 3D effect. The void these symbols leave behind will be replenished with new symbols falling from the top. These newly added symbols might actually immediately lead to new wins! Also, what's really amazing, is that per winning combination, the multiplier increases. This means that after three wins in a row with the avalanche feature, the multiplier will be 3x. The maximum multiplier is one of 5x. 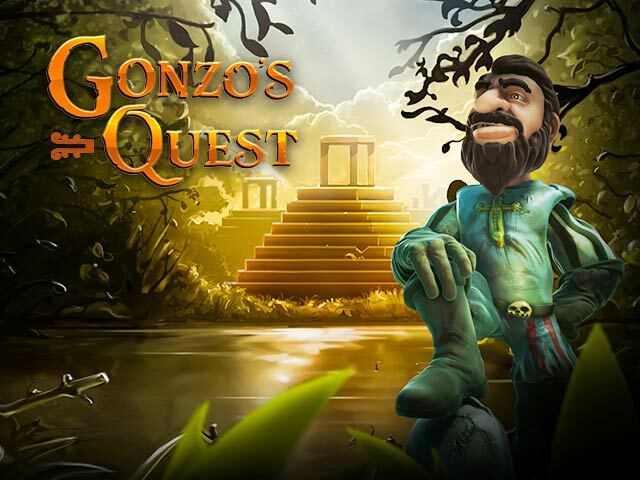 Gonzo’s Quest is a story about a Gonzalo Pizarro and his quest to find the lost city of El Dorado, where he hopes to find gold. 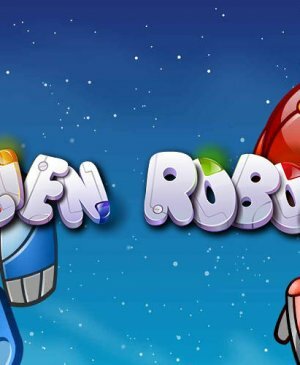 This slot by Net Entertainment revolves around this character and it is an exciting and adventurous slot. The avalanche feature with the multiplier is what makes this game so appealing, especially if you manage to reach Free Falls. During these free spins, the multiplier is even higher, meaning that only here you can win the maximum potential win on this slot. 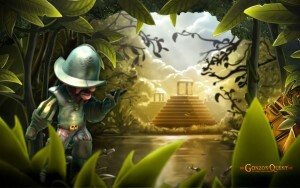 Gonzo’s Quest revolves entirely around the person of Gonzalo Pizarro, who also plays a big role in Netent’s advertising. This is a guy you will spot on many of Net Entertainment’s banners, at many online casinos. The slot has five reels and three rows, even though you wouldn’t really call them reels, with the active avalanche feature. The avalanche function means that all symbols part of a winning combination will explode with a 3D effect. The void these symbols leave behind will be replenished with new symbols falling from the top. These newly added symbols might actually immediately lead to new wins! Also, what’s really amazing, is that per winning combination, the multiplier increases. This means that after three wins in a row with the avalanche feature, the multiplier will be 3x. The maximum multiplier is one of 5x. All symbols and sound effects are based on the overall theme, making them all the more fun. It also is such a fun game to play because there is constantly something going on. And usually, that has to do with the little man on the left-hand side. Gonzo’s Quest has a great free spins feature, which it calls free falls as the avalanche feature plays such a prominent role in the game. When at least three scatters land on your reels, you will go to these exciting free falls. First, you will see a pyramid and bells will toll. Free spins are spun on the same playing grid as regular spins. However, the multiplier is different, meaning that wins can be a lot higher during free falls. 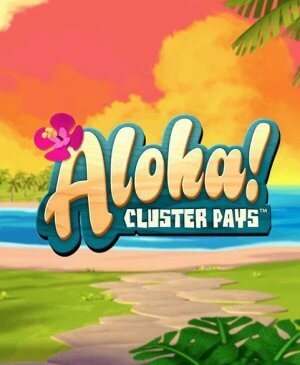 That is, during free spins, the multiplier increases per three. That is, instead of the multiplier being 1x during the first spin, it’s 3x. Subsequently, the multiplier increases to 6x, 9x, 12x, and, eventually, 15x. 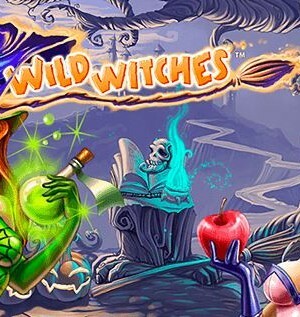 So, wins can really add up during free spins, especially when you’re lucky wild symbols-wise, and when you win additional free spins. These awesome free spins are an important reason why this game is so popular. 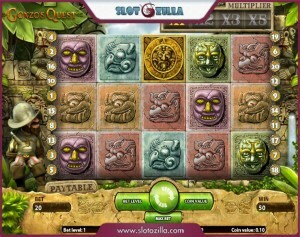 Gonzo’s Quest uses a total of 20 pay lines and is one of Netent‘s platinum slots. The fact that it’s a platinum game means that it uses a lot of effects and that you can win even more than on most other slots. Even though 20 pay lines isn’t that many, with the avalanche feature, you have nothing to worry about! Namely, the avalanche feature basically is a free re-spin plus a multiplier! This way, Gonzo’s Quest is an incredibly interesting slot. Also Gonzo himself, who likes celebrating wins with you, is a great touch. If you would like to see him do even more, just wait a little while and do nothing; he will find something to entertain himself with. When first opening the slot, do watch the introduction video!